Deer Valley feels almost private, its posh with high marks for service and well groomed snow. Deer Valley is pricey- but the best things in life aren’t always free for your family. Kids will love the adventure zones and mascots, parents will love gorgeous aspen groves, the on mountain dining and luxury hotels like Montage St Regis and Stein Eriksen Lodge. Warning: no snowboarder allowed at Deer Valley – consider instead next door Park City. Park City is huge now – 7,300 acres including the Canyons, a Vail Resort. 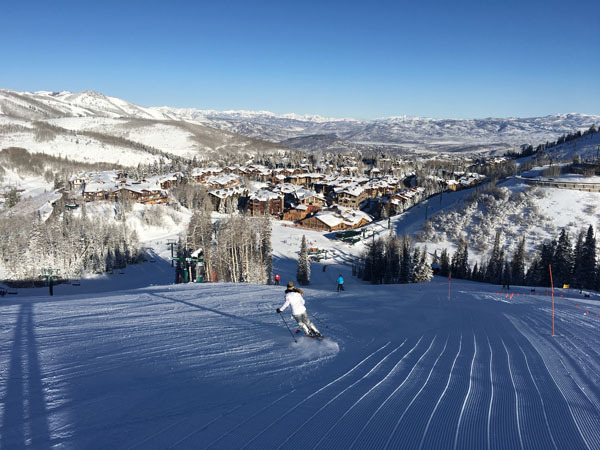 Tons of terrains, US Ski Team and Olympic caliber terrain parks, mountain coasters and two ski in ski out villages make Park City ideal for family ski vacation. Historic downtown Park City is cool for teens ad tweens, while the Canyons slopeside village is convenient for families with young kids. Yes, snowboarders and non-skiers (read: shoppers) are welcome here. Solitude in Big Cottonwood is as it sounds – quiet, off the beaten path and not as busy as other Utah ski resorts. A quaint on mountain village has just what you need for family vacation, and Solitude mountain has something for everyone, swift lifts, open powder bowls and lots of groomed blue squares to build your egos. Snowbird and Alta in Little Cottonwood abut each other and you can ski back and forth like in Europe, no snowboarders at Alta though. Snowbird’s amazing base to 11,000′ summit aerial tram to the new Summit Lodge at Snowbird is worth a trip. Staying at the Cliff Lodge is convenient for the diehard ski family. Alta has an old-school ski area feel, with hearty terrain and a great ski history. Snowbasin hosted the Olympic Downhill speed events, and can host your family with over 3,000 acres of snowy terrain. Not only does Snowbasin have Utah’s best snowmaking, it also has incredible on mountain lodges for ski in lunches, three gondolas, and gorgeous views of four states. Kids will love skiing the Olympic downhill courses, parents will like the posh ski lodges. Snowbasin is sister resort to Sun Valley Idaho- same owners, same stylish look. Stay nearby at Lakeside Resort Properties and enjoy great ski and stay values without the crowds of Park City or Vail. Powder Mountain may be Utah’s best kept secret, in the town of Eden, this huge ski area, over 8,000-acres, has classic groomed runs, plus tons of side-country to explore with a guide or by cat skiing. Powder is great once the kids are ready for alpine adventure, as its in bounds side country – you hire a guide, catch a shuttle bus from the base or take a cat to access Powder’s natural snow bowls and glade skiing. Owned by the Summit Group, this is also where the cool young execs come for mountain inspiration – the Summit Series. Lodge in the valley of Eden at Powder Mountain Getaways for a full condo home with amenities.